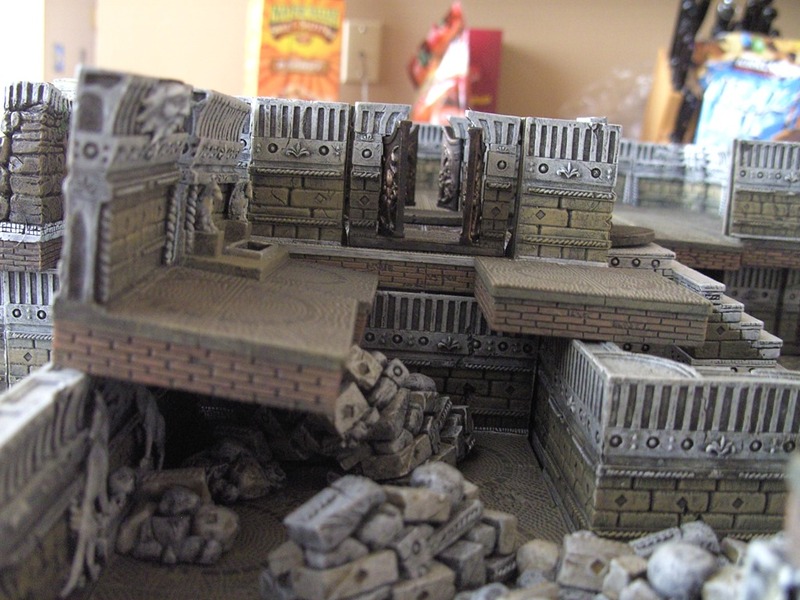 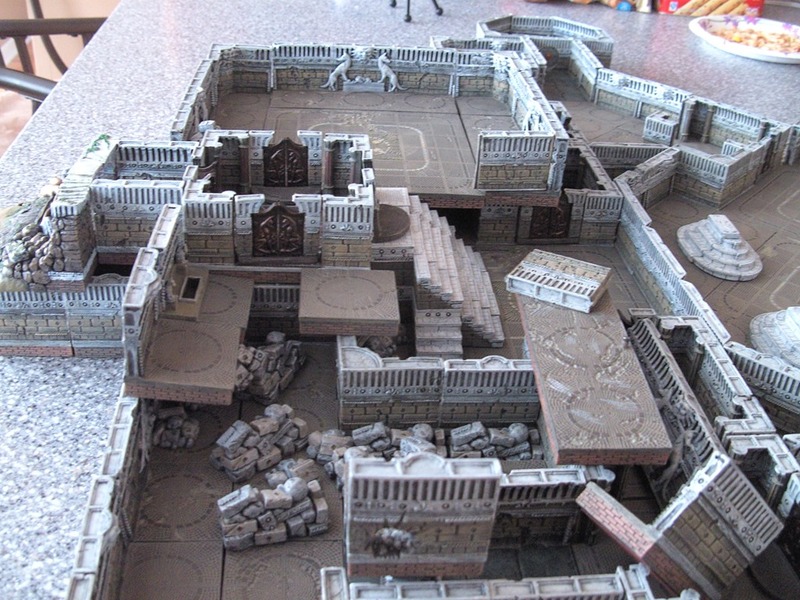 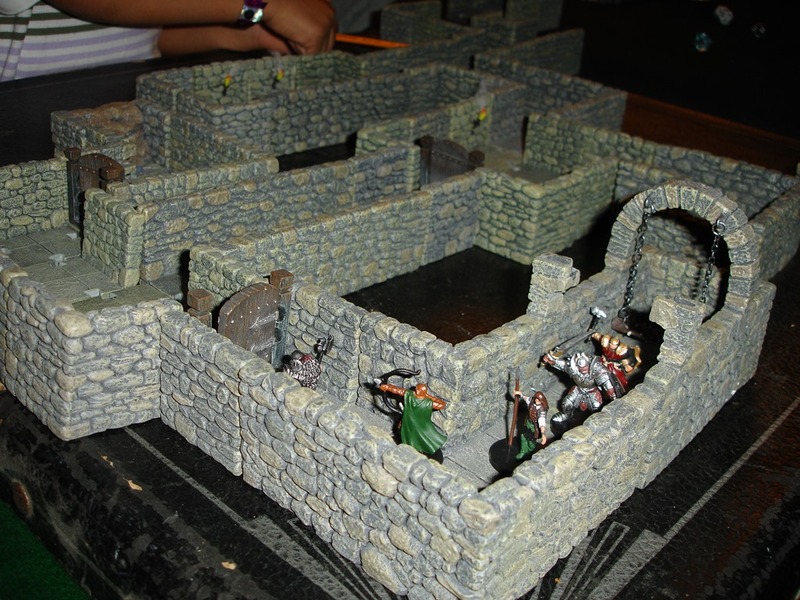 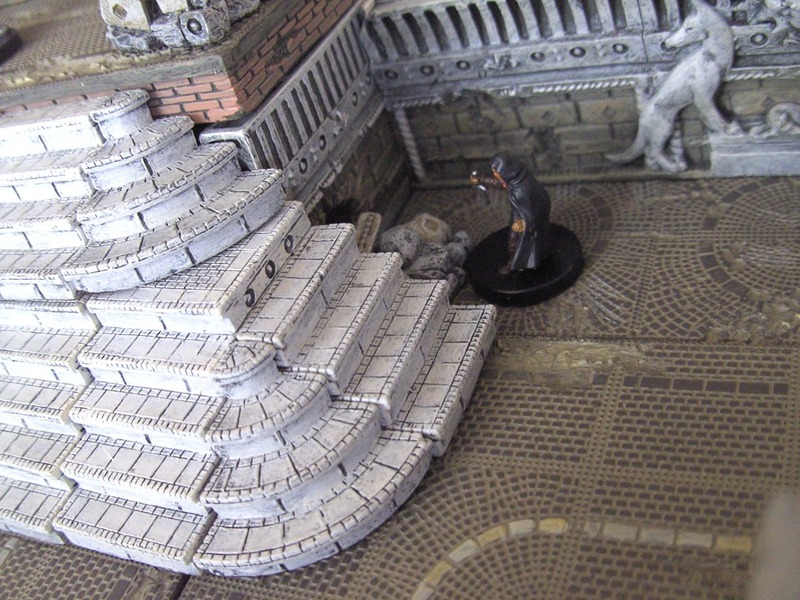 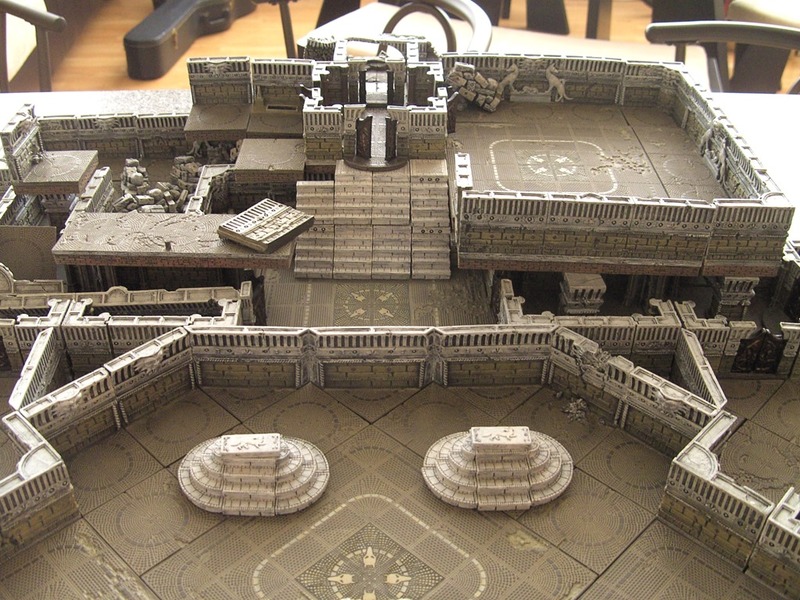 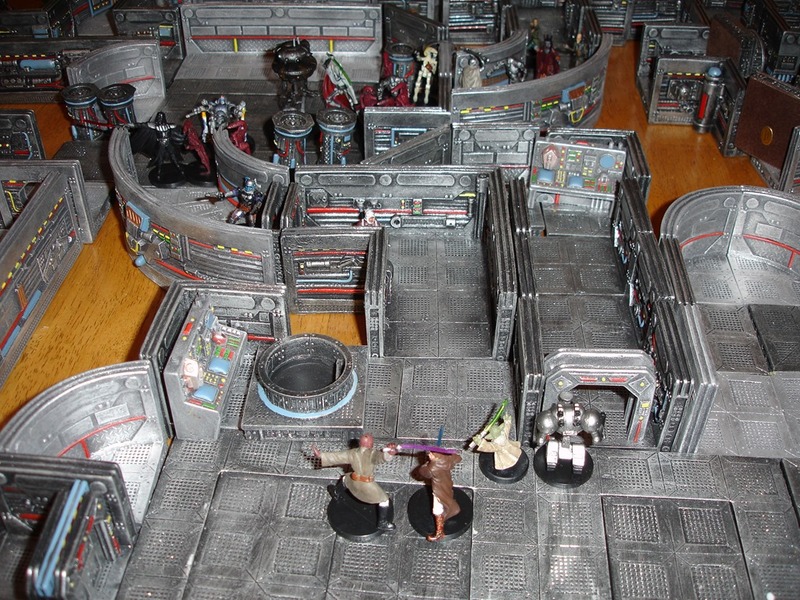 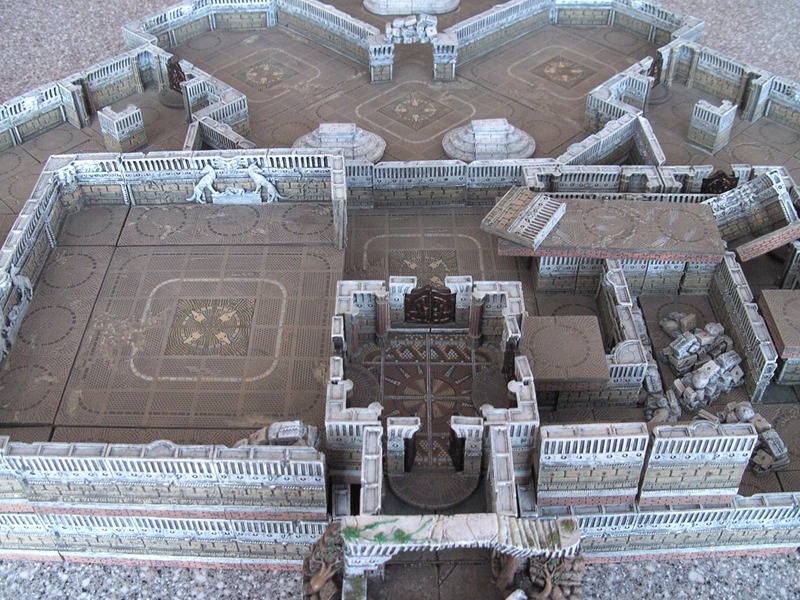 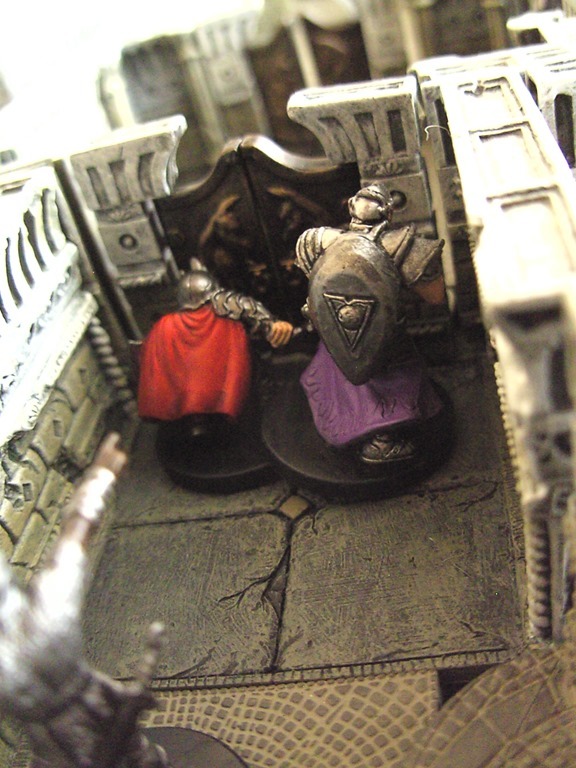 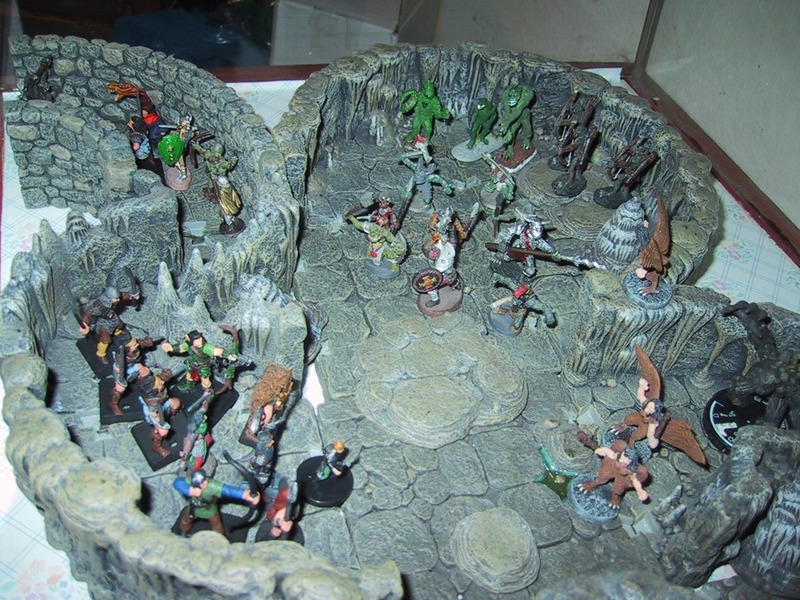 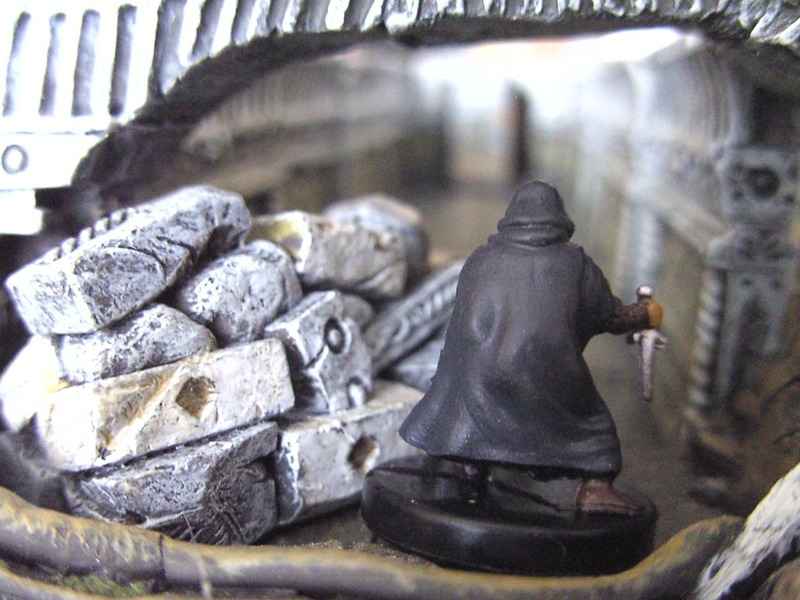 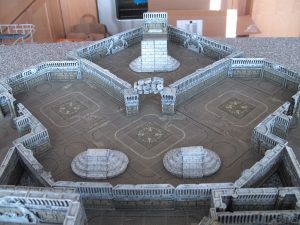 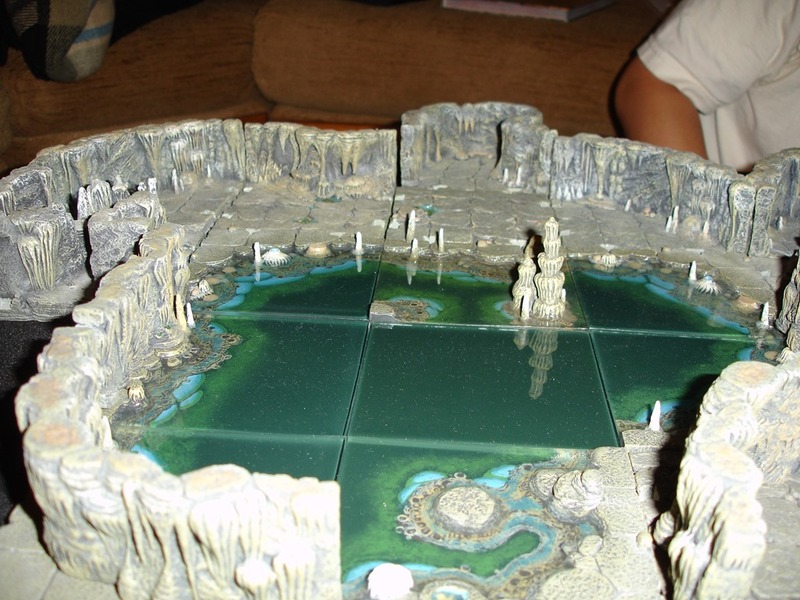 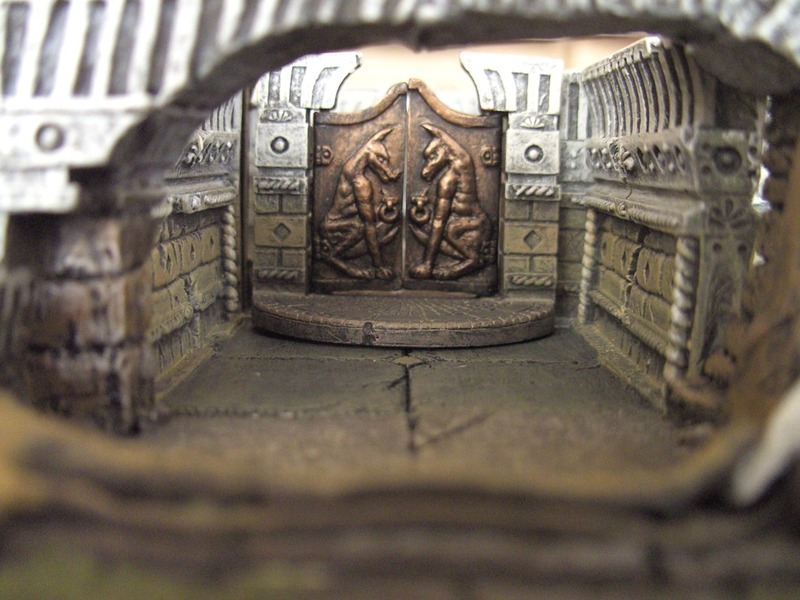 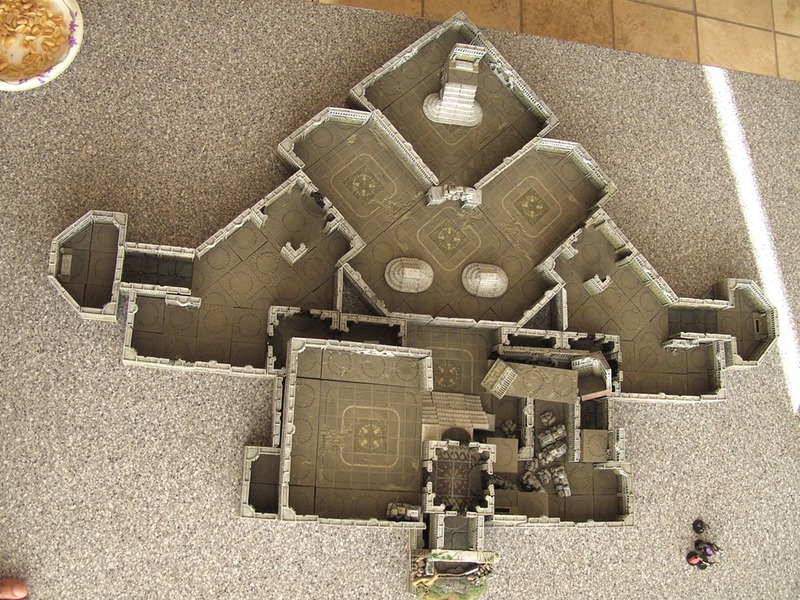 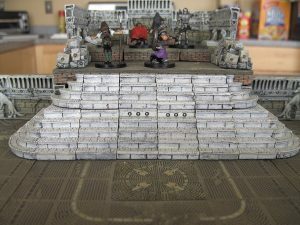 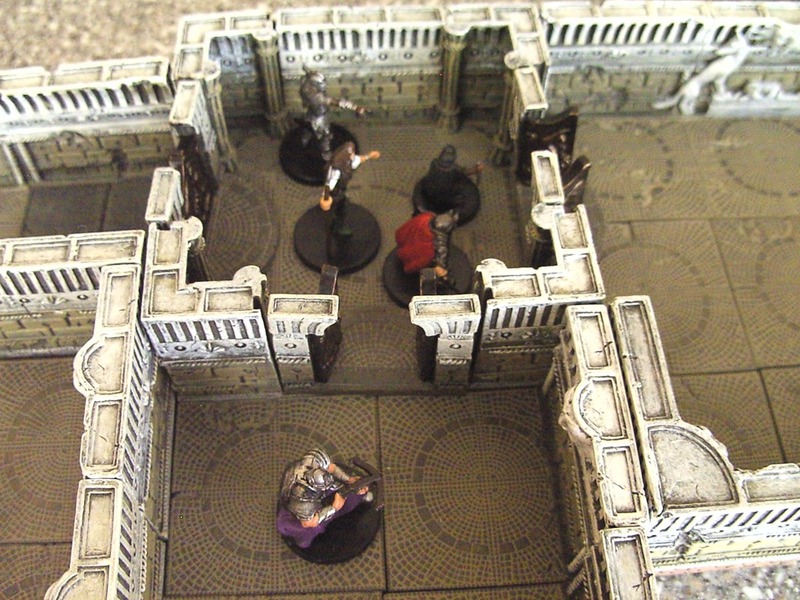 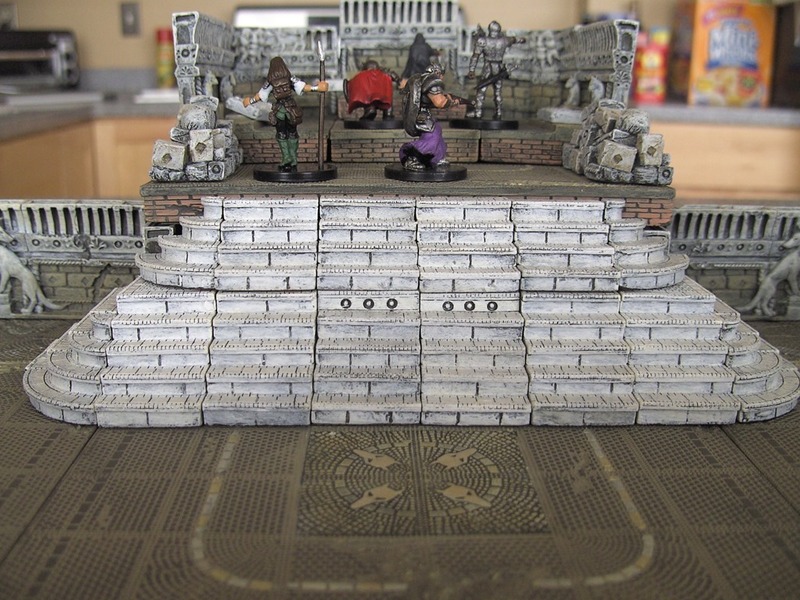 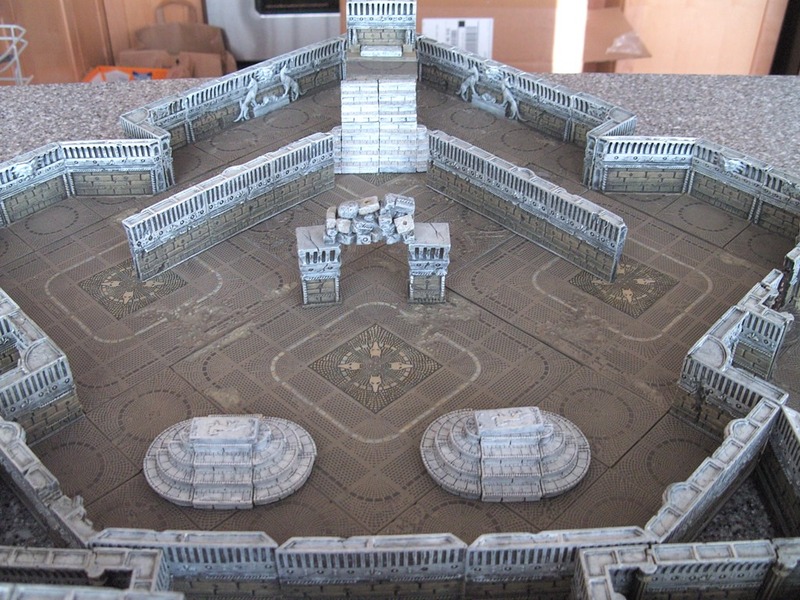 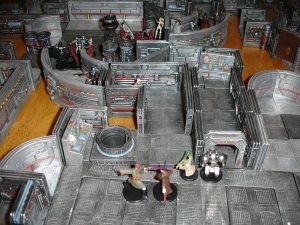 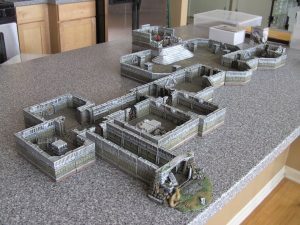 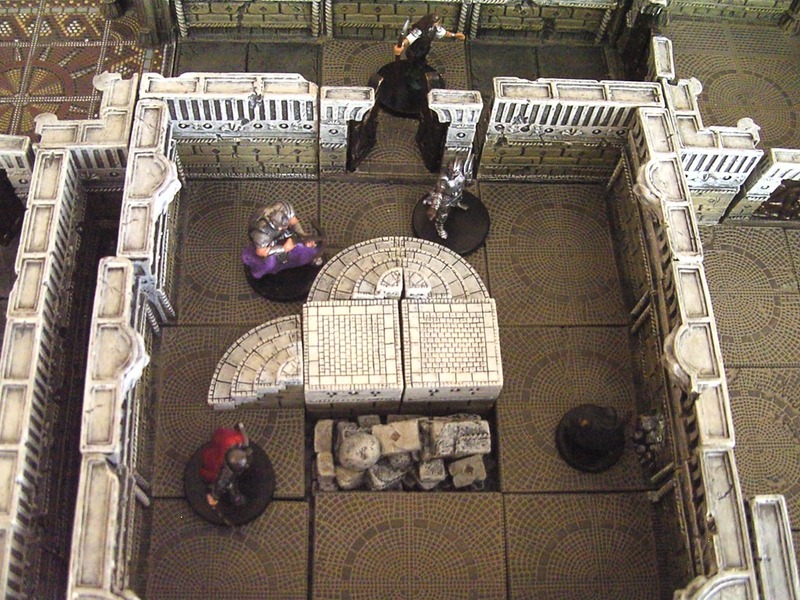 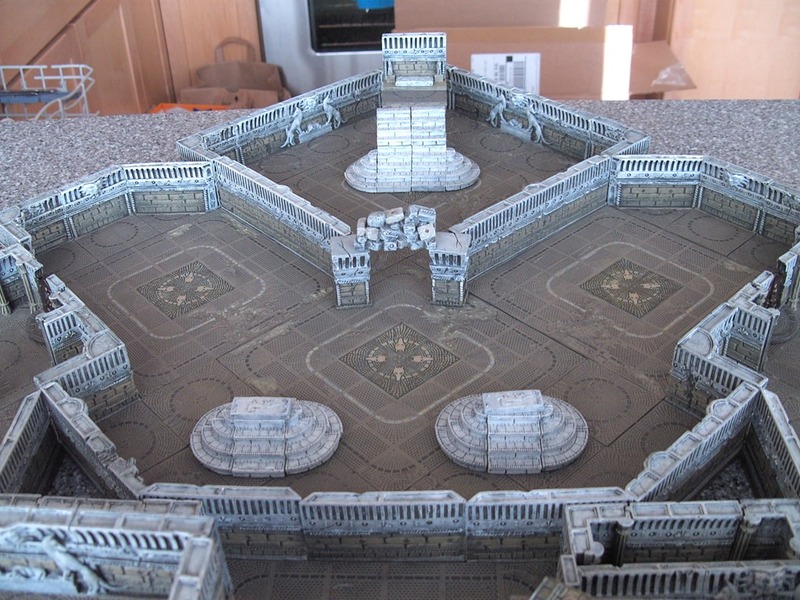 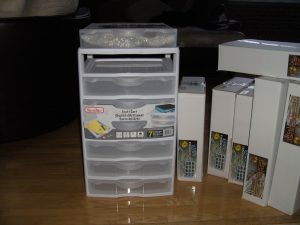 [Originally posted on Dwarven Forge forums 2009 Jul 01. 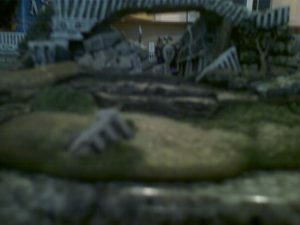 In looking for these pictures, I found better ones I took a week later. 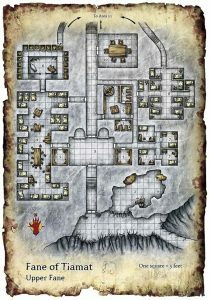 So I’ve posted these up in place of the original ones, from the perspective of an adventuring group making their way through]. 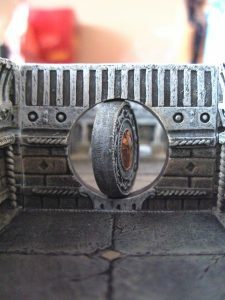 Secret spinning doors, and secret spinning walls! 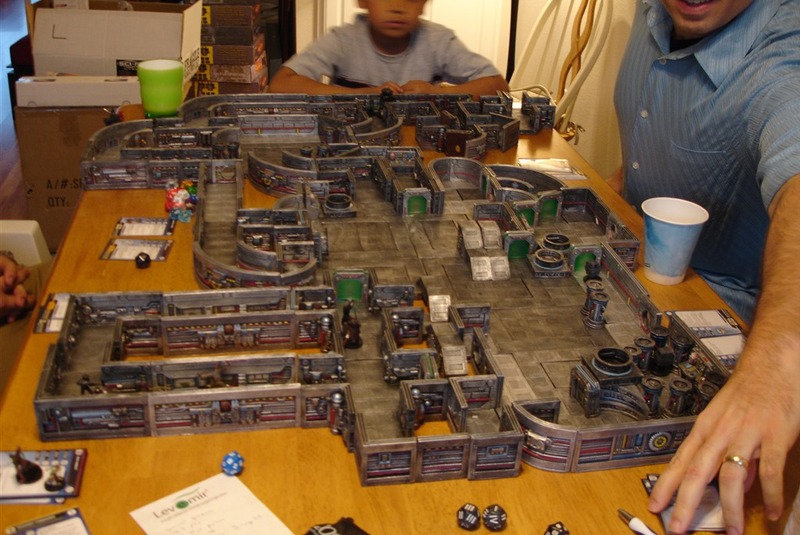 1: The overall layout which AJ (in the back there, who was thrilled to play with DF!) help to setup… We pretty much just pulled out all the Sci-Fi pieces I have and tried to put them together… around 5 each of starter set, passage set, and alpha expansion, with 2 beta. 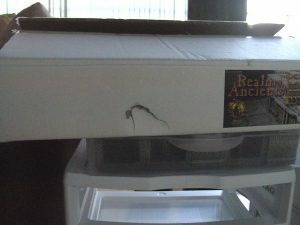 The first two pictures shows the whole drawer and cabinet. 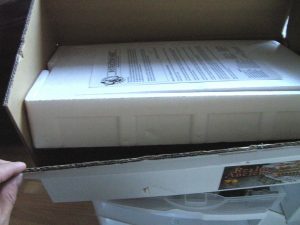 The DF boxes next to it should give an idication of its size (it was hard for me to image on the Target webpage). 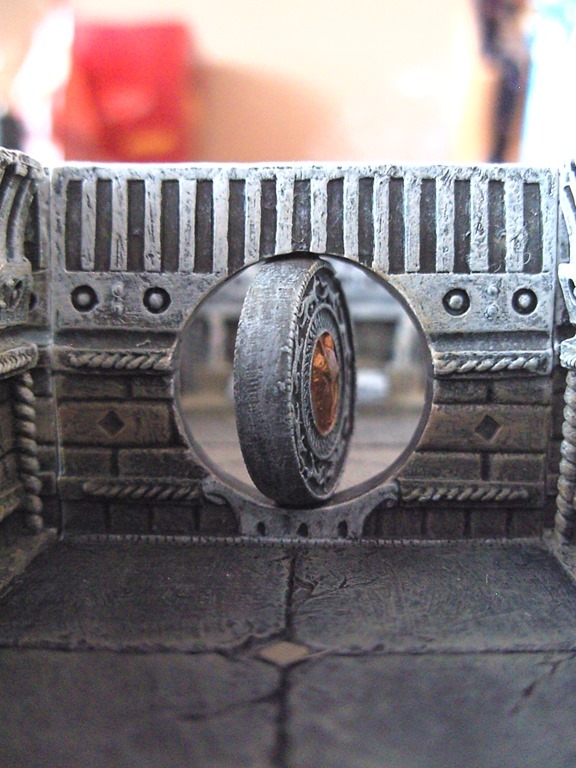 Also, it comes without the wheels attached, and I’m leaning towards not putting the wheels on. The next picture shows the contents of one drawer with just one RoTA set in it. The one after that filled completely up (in this case, with one of the bonus 4-way intersections). 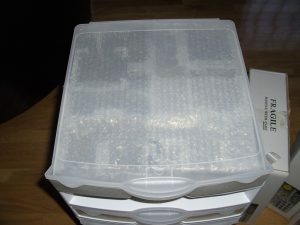 Because there was some play between the top of the DF and the lid, I cut up some of the bubble wrap that came with the individual pieces and put a layer on top of the pieces to give them some cusion to prevent the occasional scratch. 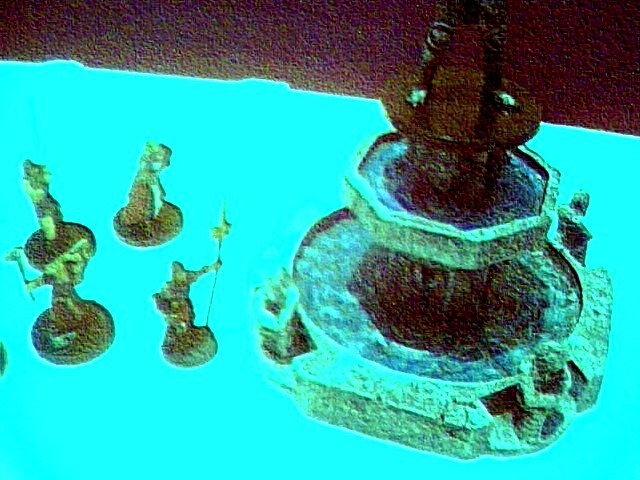 The first picture is hard to see (sorry! 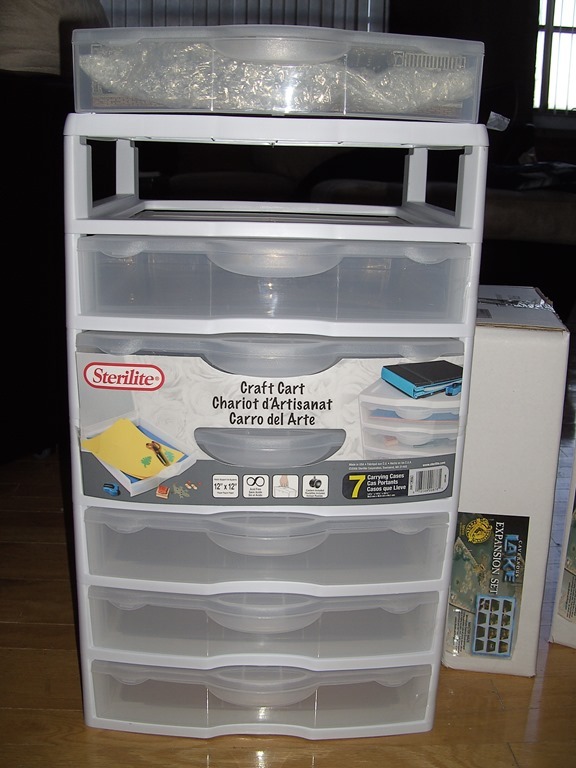 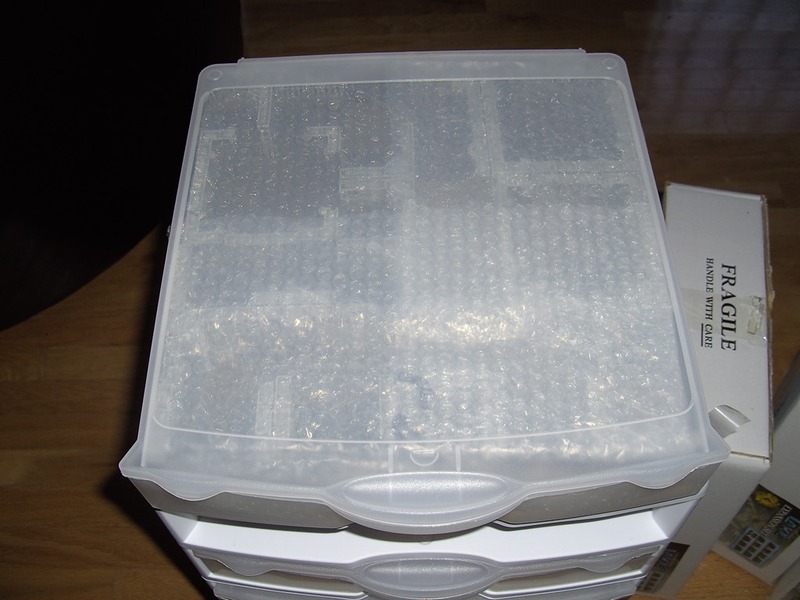 ), but you can make it out beneath the lid in the following one. 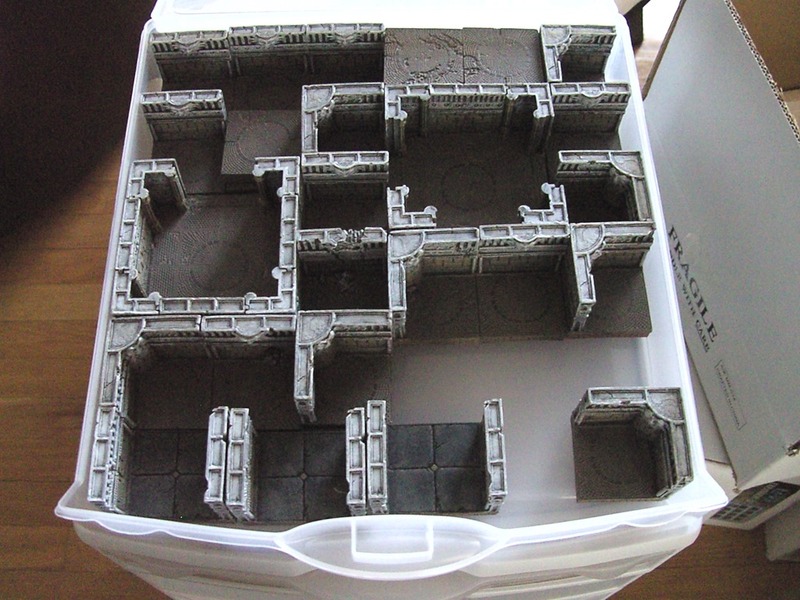 Oh, and I thought I’d show how well the DF boxes protect the pieces. When one of the UPS boxes came, there was a large hole in the side of it. 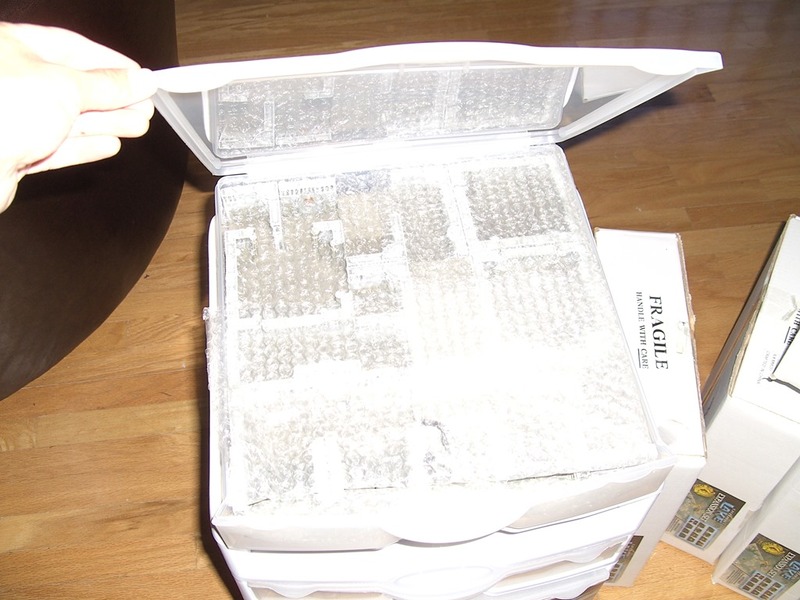 Sure enough, whatever punctured it went deep enough that it pushed through the peanuts inside and punched a hole in the white DF box. But the styrofoam in there absorbed it completely without any damage to the pieces. 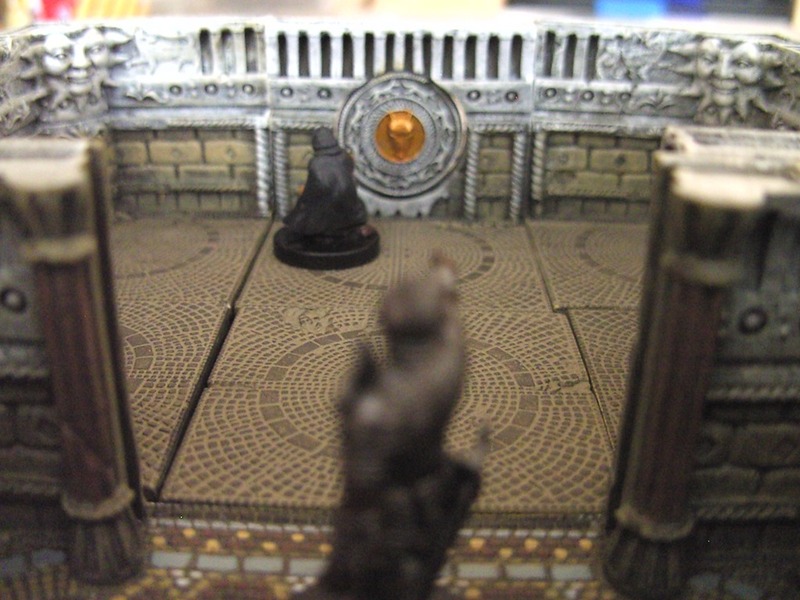 Hmmm… stumbling on more pictures while sorting through my files. 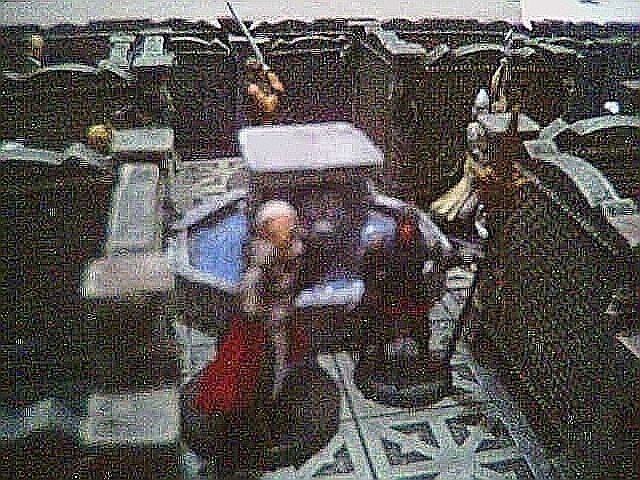 Pictures taken 2004 Jul 27. No actual game here – I was just setting up my painted minis in a display case. 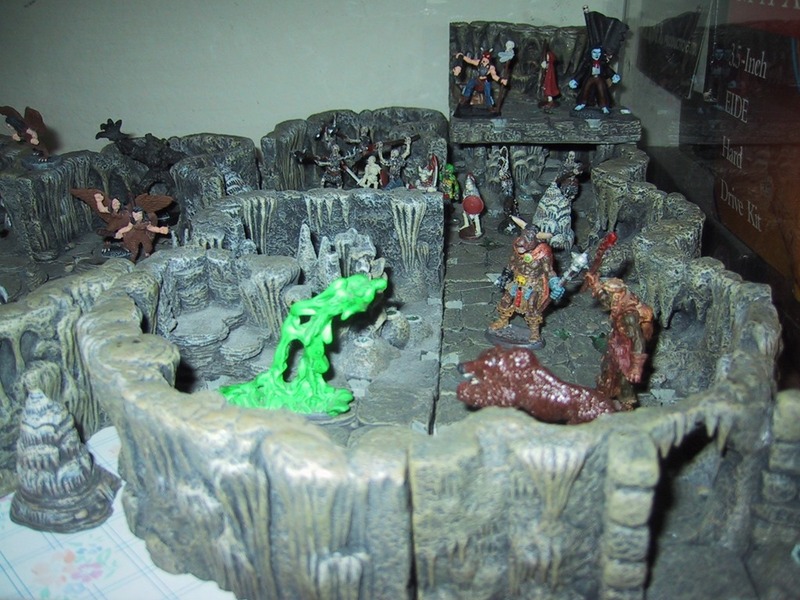 I’m particularly proud of the three minis in the foreground of the first picture – they were some of my first paint jobs I did in the 90’s on the old Ral Parth Monsters box set. 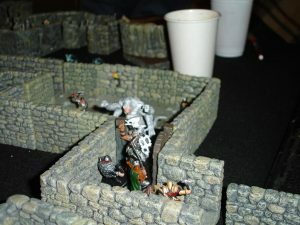 That minotaur has remained a favorite of mine. The green slime mini was one of the first I painted using a very watery green paint that just turned out fantastic. 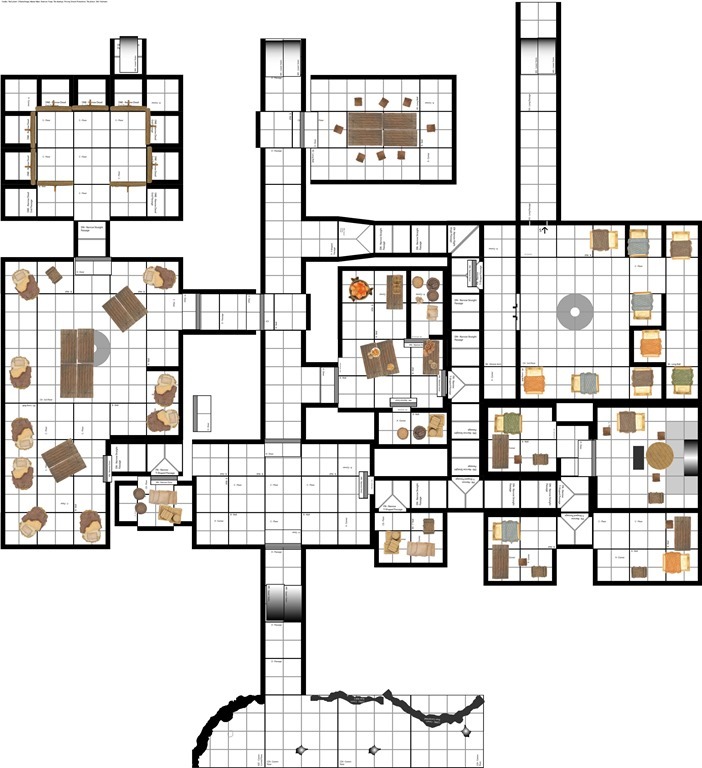 The ones below show off the DF Den of Evil sets very well. 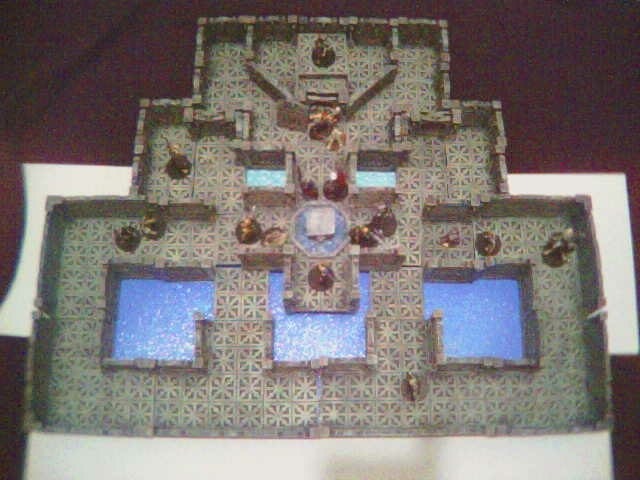 I think it was my first attempt at making use of the negative spaces with the plastic water cutouts. 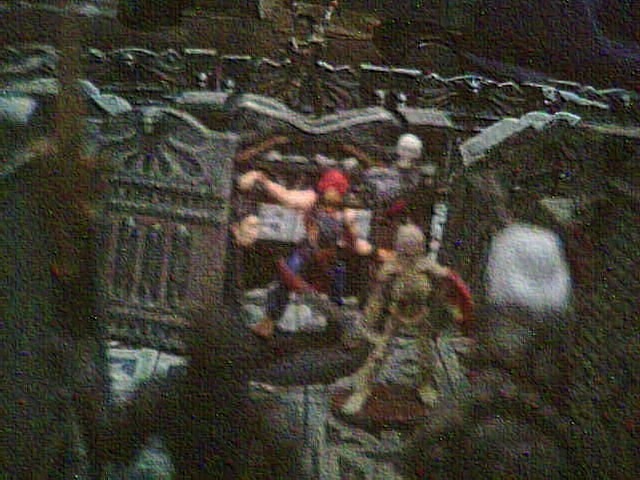 I can’t remember if this was from a game, or just a diorama like above. I’m also not sure why the pictures are so grainy – if it was the camera, or a specific setting I was using, or if I scanned these from a photo (I don’t think so). 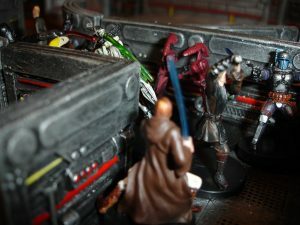 It’s probably operator error. An introductory Hackmaster adventure I wrote for a FLGS game day. 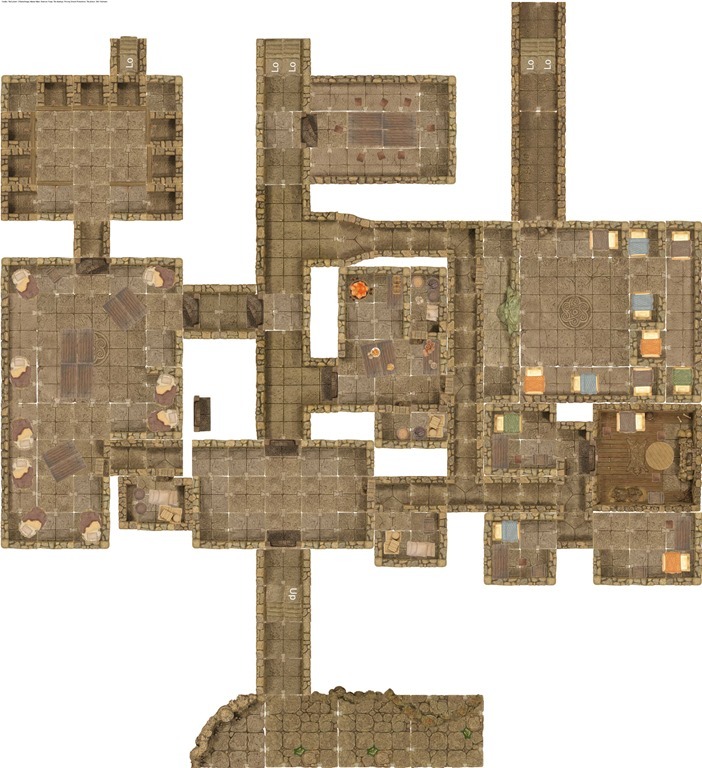 I first laid out the dungeon using pfwork’s TileSystem program, then used that as a guide for the pieces to bring. Second set, the PCs face off against the Orc chieftain and his remaining bodyguards (very reduced in number as the PCs arrive shortly after a failed coup attempt). 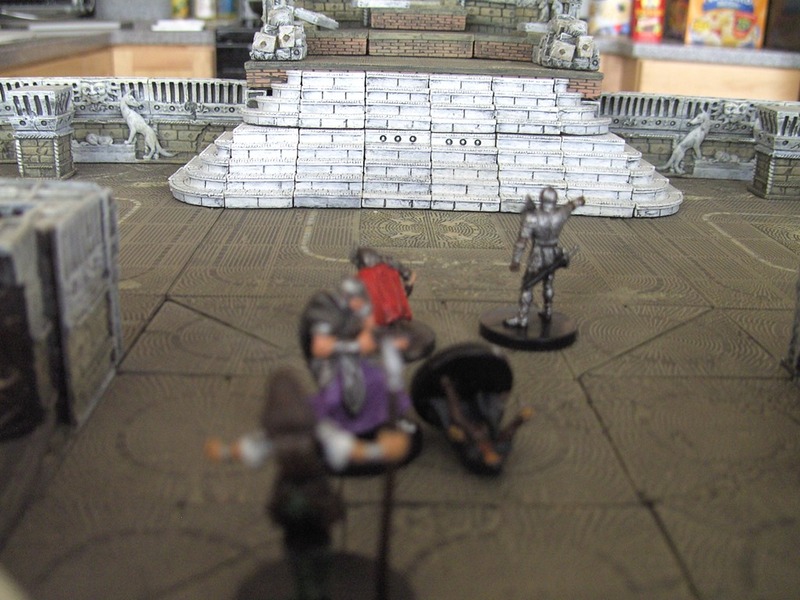 “The Orcs are defeated. 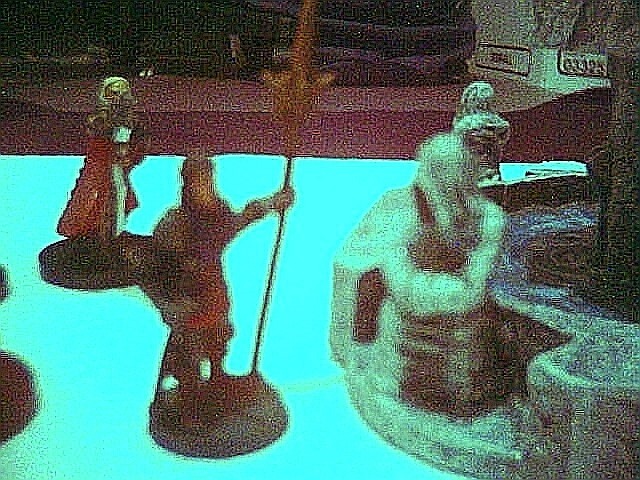 The Chieftain and his followers are now dead and the immediate threat to Riversbend vanquished! 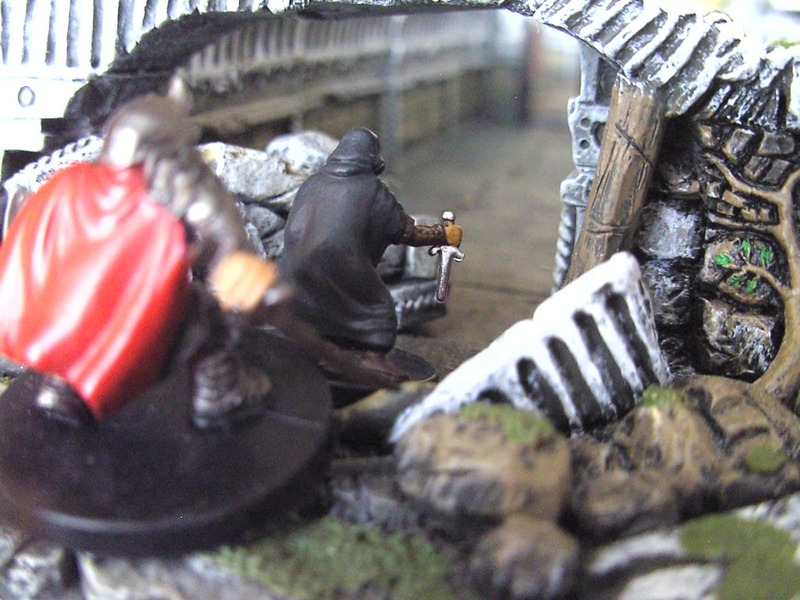 Even the unexpected appearance of a shaman at the Chieftain’s side proved insufficient to overcome your battlemight! At your approach, this door – if it may be called such, has been so finely worked that were it have remain closed, it would have appeared just as the remainder of the wall! 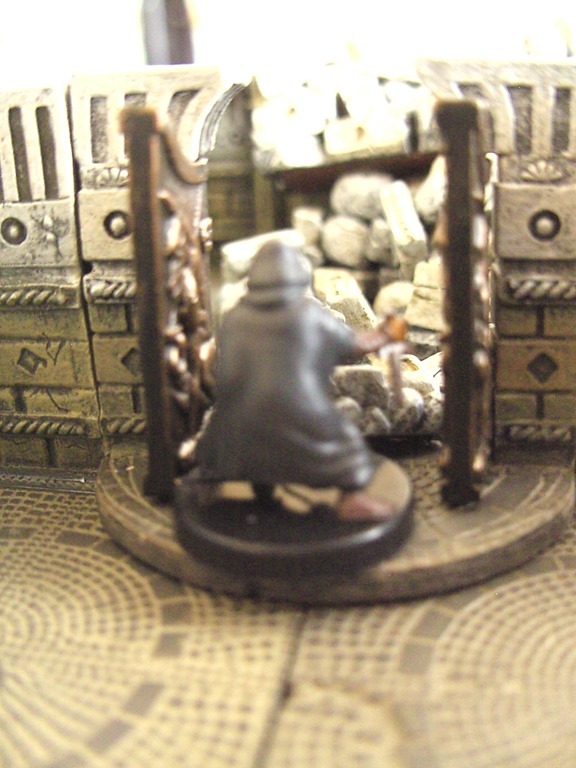 But now it stands open – and just beyond it, an eerie glow of red light emanates. These last few pictures are what the TileSystem map came up with; I didn’t have enough time to set up the whole dungeon, so had just put together the final portion. 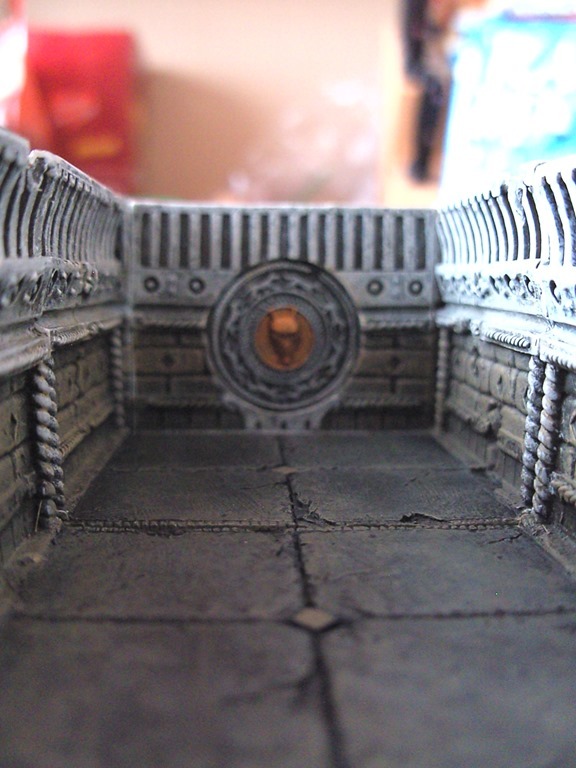 Wow… in retrospect, the quality of the pictures and the build on these are appalling! 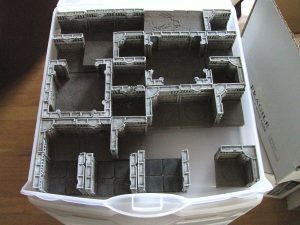 Guess we all have to start somewhere to learn! 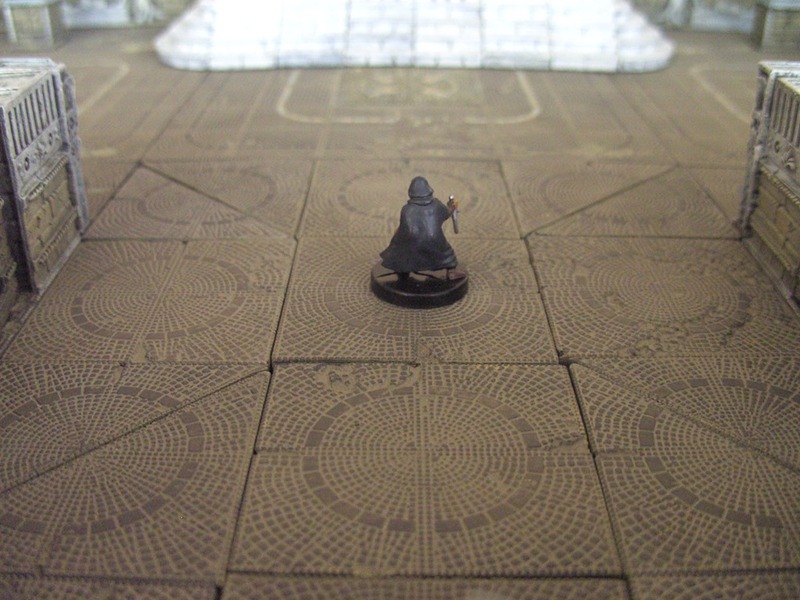 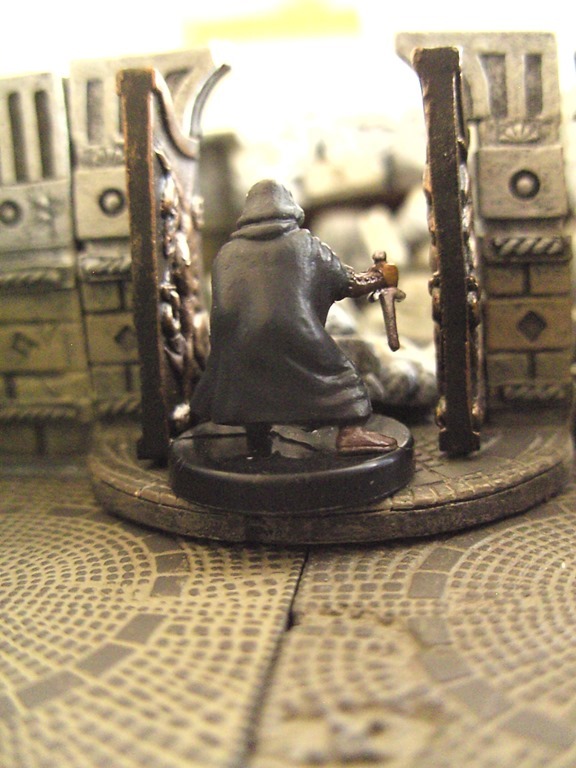 The group is tasked with locating a little girl who has wandered off into a maze guarding a Tomb of Kalec’tor – a knight who fell in battle defeating a demon that terrorized the area. 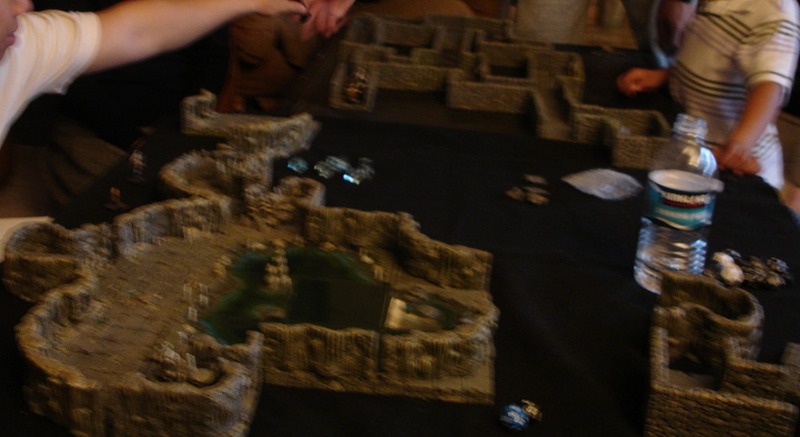 This is the first round of the tournament which involved getting through the maze towards the center of the Tomb. 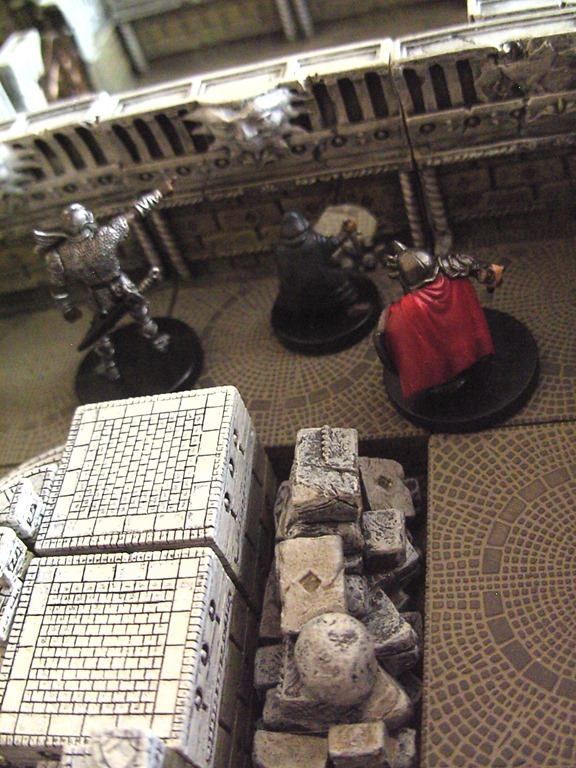 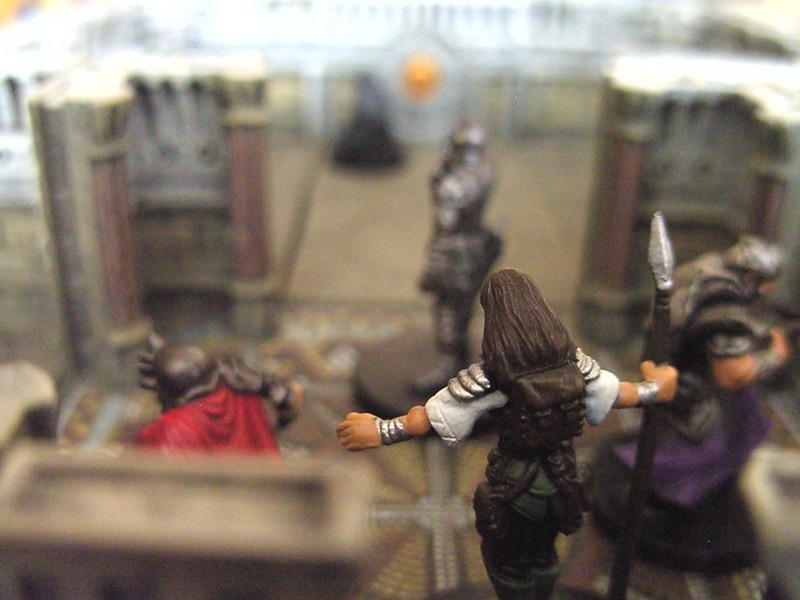 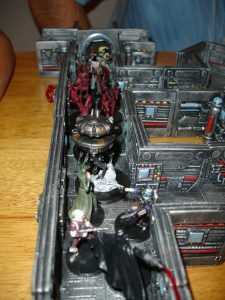 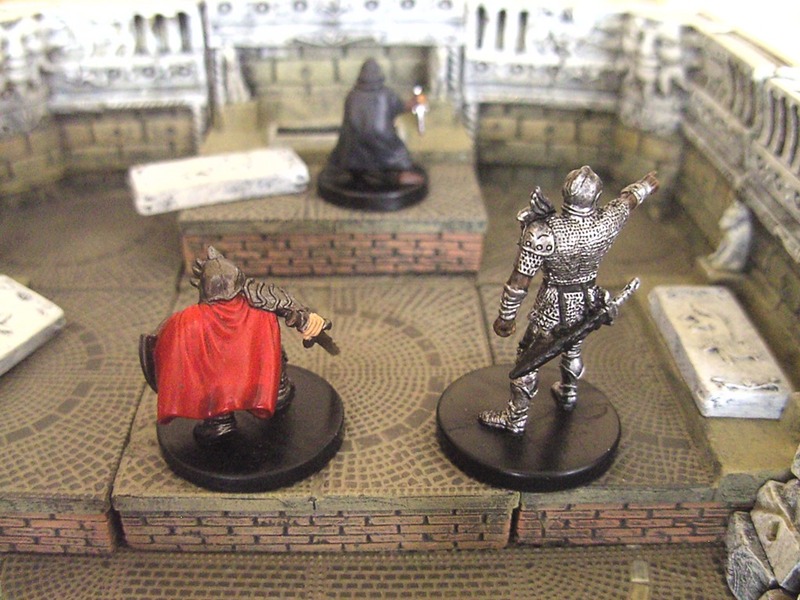 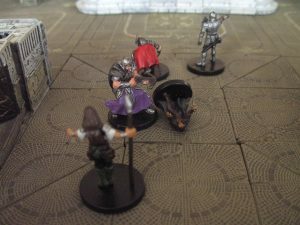 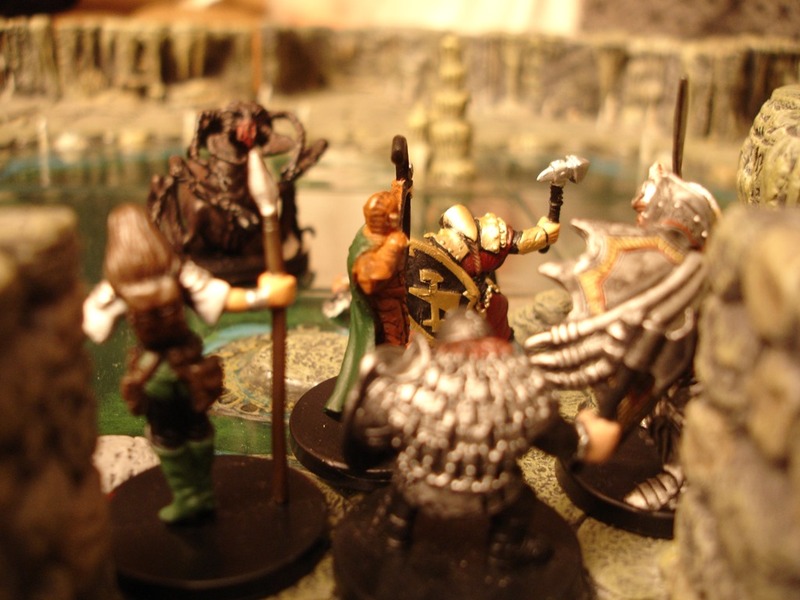 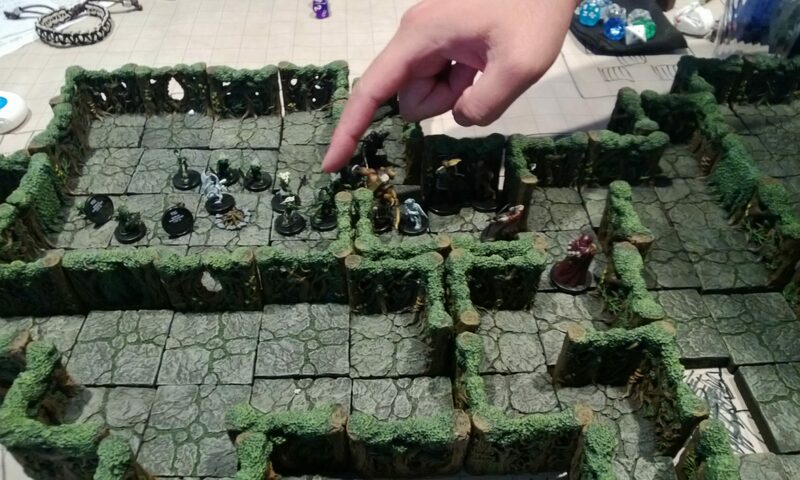 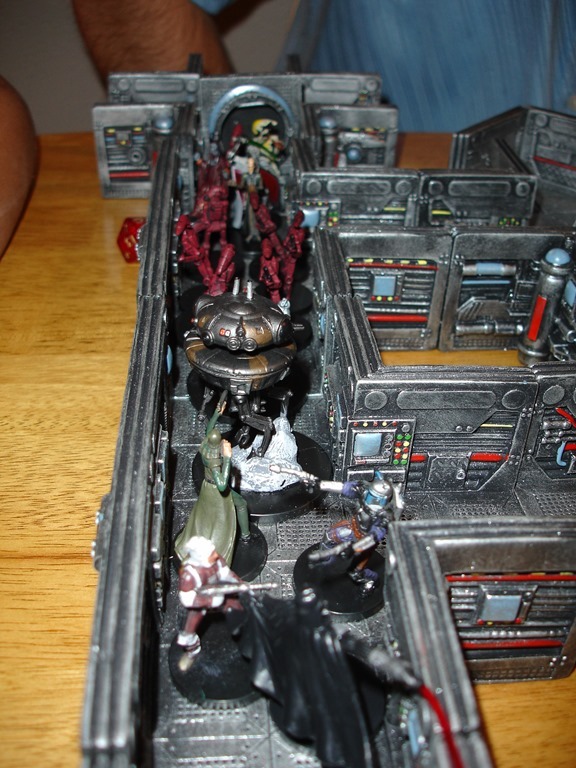 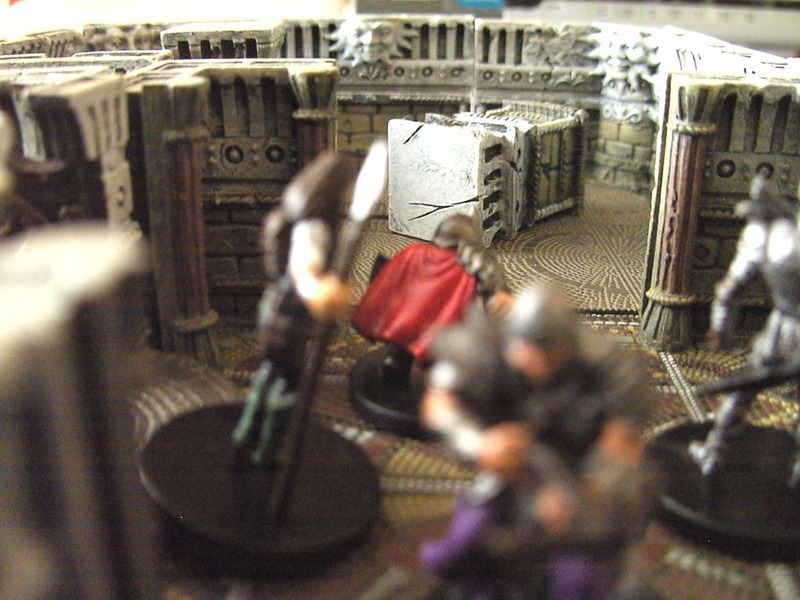 The top encounter shows the party trying to figure out an articulated Statue which is full of traps – ie. 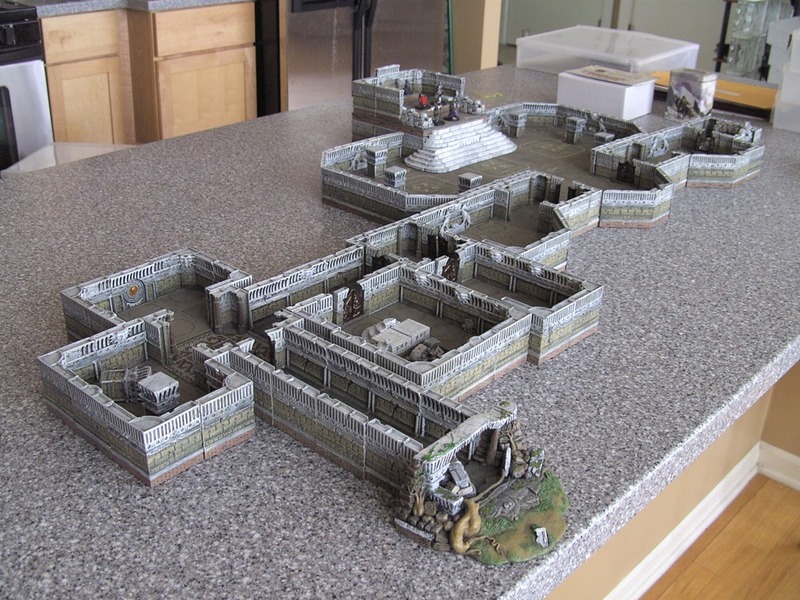 sending darts from one wall, or releasing poison gas in another area, etc. The bottom one is the group facing two mimics which have mimic’ed a floor (the one in the middle) and a wall (the one on the side). 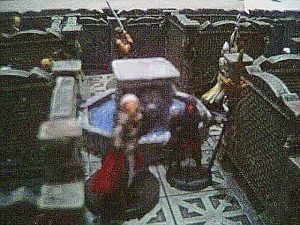 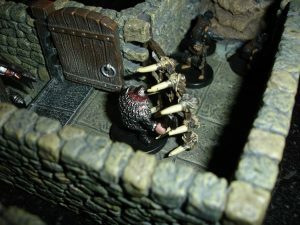 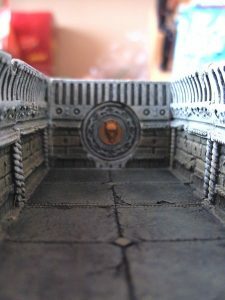 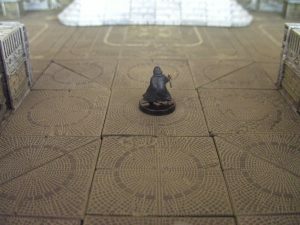 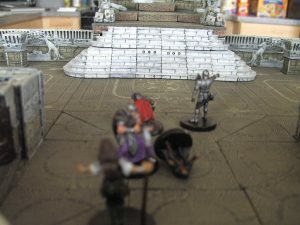 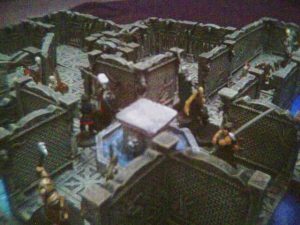 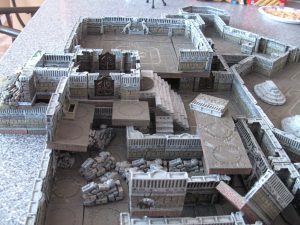 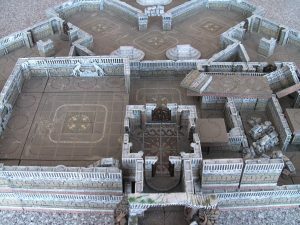 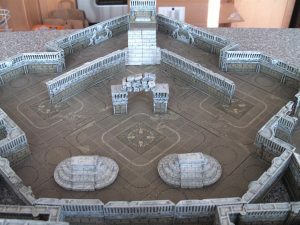 I’ve been going through my old Dwarven Forge posts on the forums and remembered that a lot of the old pictures were deleted during a software error around 3 years ago. I have many of them still, so decided to repost them to my blog for future interest. 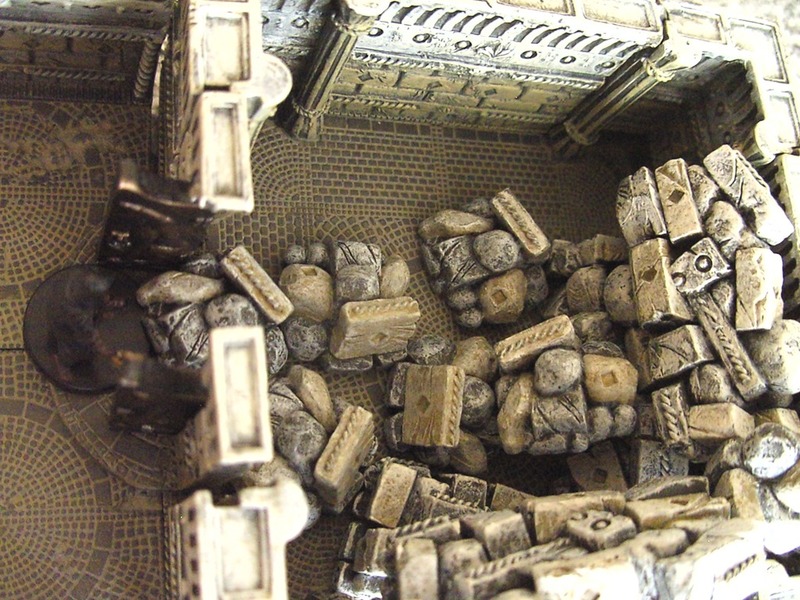 To add some flavor, I populated the Research Base with minis from my all time favorite RPG – Star Frontiers! Why is it that no communication has been heard from the base in over 4 months? 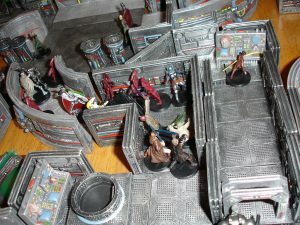 The Star Law Rangers enter to investigate. 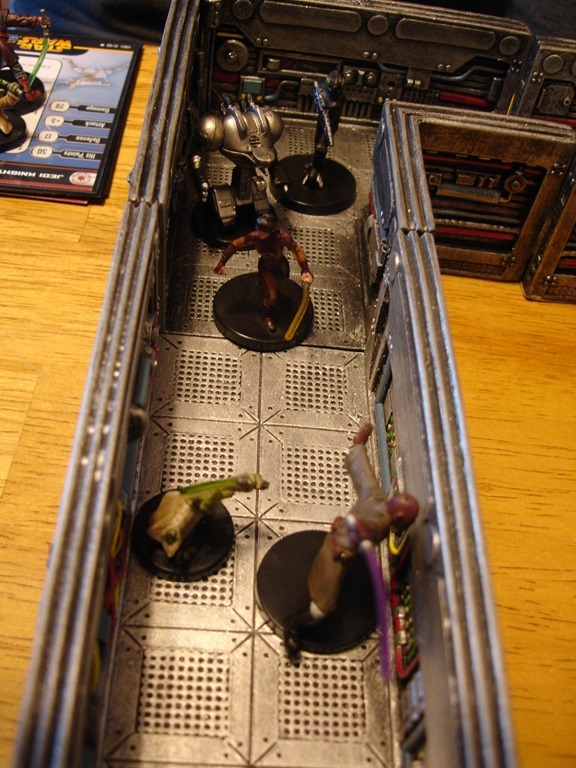 Getting into the airlock was no easy task. Strange, the blast door didn’t close properly – that must be how the radiation leaked out into the remainder of the base! But that looks more like sabotage than an accident! 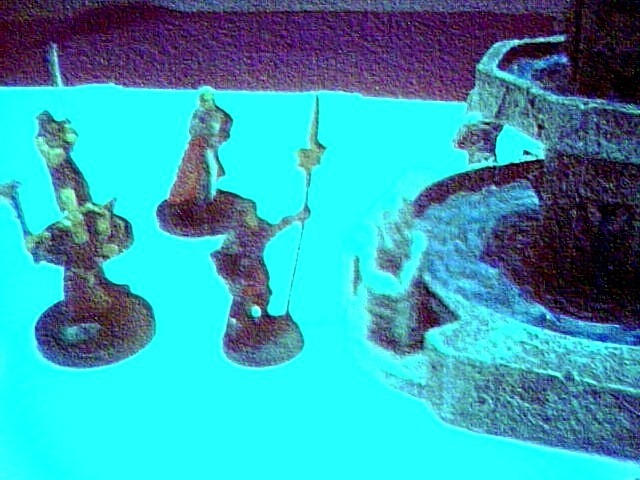 Ahh… good, the computer banks should tell us what’s occured. 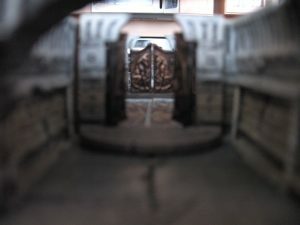 Gotta find some way to use the corner fillers… a portal to the next level sounds good! 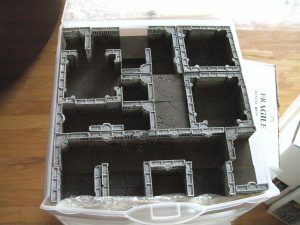 This I thought might help out other builders – I didn’t have anything to use as a filler for the negative spaces and there was a weird gap in the port room. That’s when I realized that the floor inlays that come with the Alpha set are thin enough that they could fit under the other pieces without being easily noticeable. 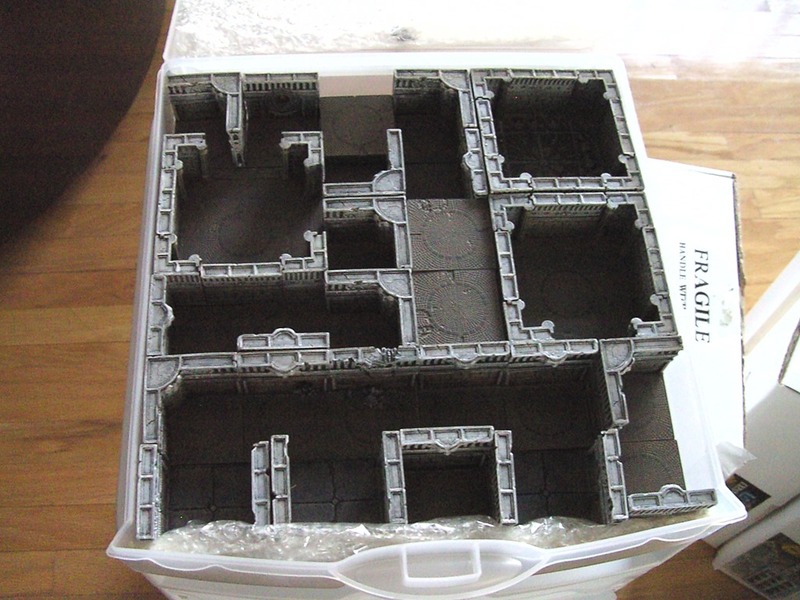 Plus, they’ve got the same pattern already on them! I’ve been going through my old Dwarven Forge posts on the forums and remembered that a lot of the old pictures were deleted during a software error around 3 years ago. I have many of them still, so decided to repost them to my blog for future interest. This was also incentive for me to go through my old pictures and files to clean up my hard drive and organize. 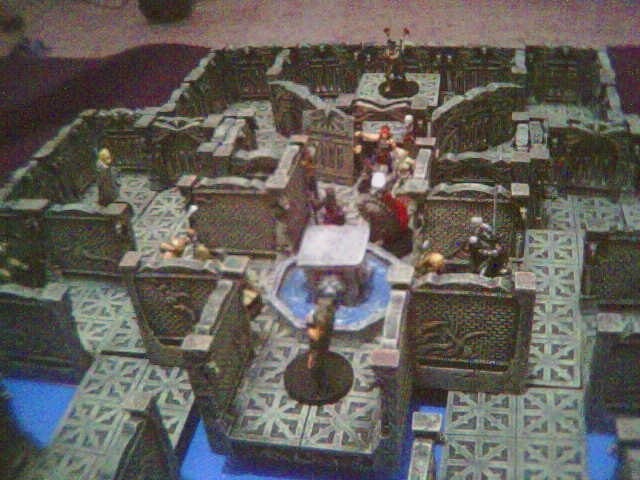 My first real use of the Dwarven Forge stuff in my home D&D game. 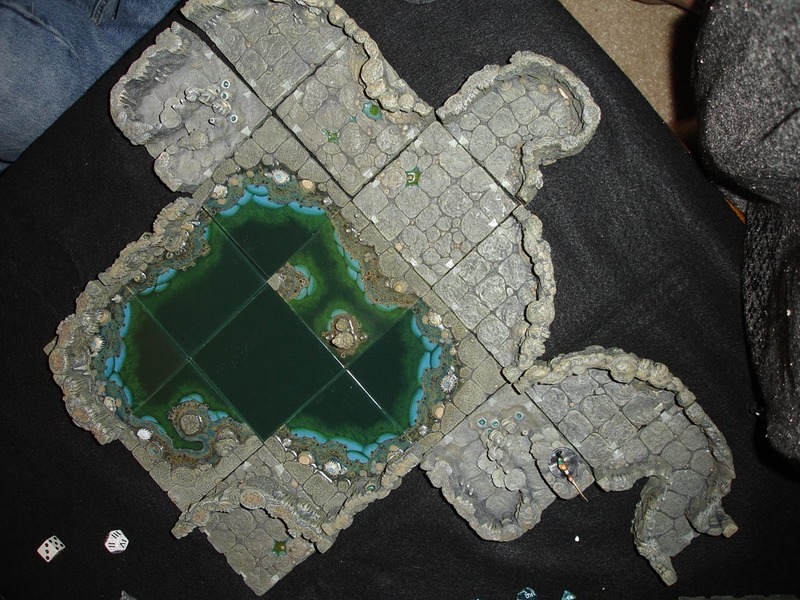 I didn’t have enough floor pieces to really re-create the large cavern, so I used the battlemat as the base and the DF stuff for walls and a raised area. 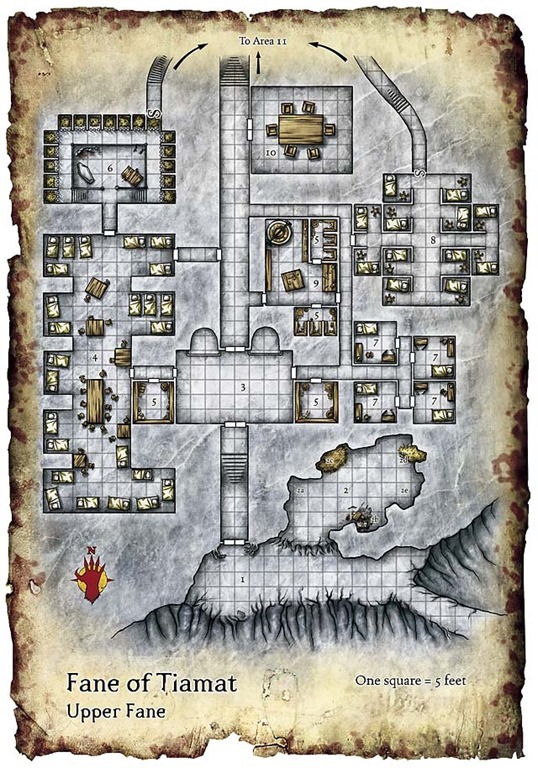 This was for our first and longest running D&D 3.0 game – the Frozen North. 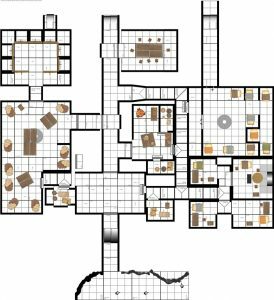 They PCs had ended up in Wallachia, Ravenloft, after tracking down the “funny man” – a Vampire that was kidnapping children. 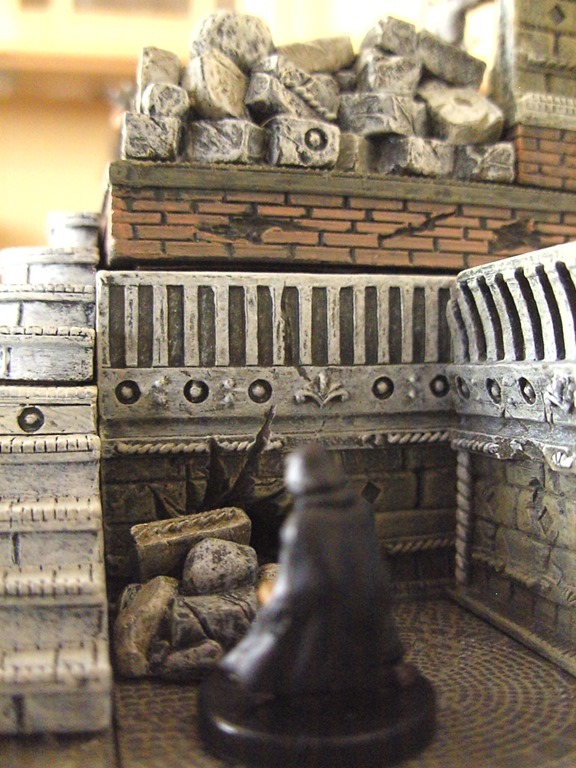 He lived in a cavern that was made of pourous volcanic rock. 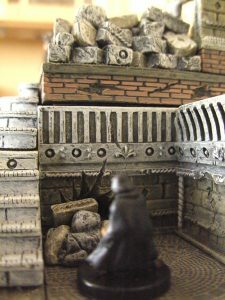 His “coffin” was inside the raised porous rock, and when reduced to 0 hp and turned into gaseous form, he retreated under it, making it quite an ordeal for them to get to his body before he regenerates.